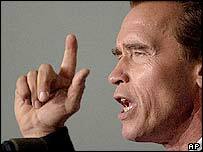 A libel action brought in London by a British TV presenter against Arnold Schwarzenegger and two of his aides has been settled, reports say. Anna Richardson was suing the California governor and two aides over comments they made about her claims that he groped her in December 2000. The parties' lawyers said in a joint statement that they were satisfied, the Associated Press reports. The Terminator star faces a re-election battle for governor in November. Details were not given of the settlement, which was confirmed for Reuters by one of the aides, former film publicist Sheryl Main. "Yes, it is true that it has been settled," she told the news agency by telephone. "I don't have any comment but it's settled and I think we're all very happy to put that behind us." No comment from Anna Richardson was immediately available. She had been suing Mr Schwarzenegger, his spokesman Sean Walsh and Ms Main for allegedly trying to ruin her reputation by dismissing her assertions that the Hollywood star had touched her breast during a press event at London's Dorchester Hotel in 2000. She alleged that the two aides had libelled her in a Los Angeles Times article which also appeared on the internet. Her libel action contended that Mr Schwarzenegger's staff said she had encouraged his behaviour - a statement she believed had tarnished her reputation as a professional interviewer. Mr Walsh made unsuccessful attempts to get the UK case thrown out, arguing that English courts had no jurisdiction. "The parties are content to put this matter behind them and are pleased that this legal dispute has now been settled," said the two-sentence joint statement quoted by AP.